There's really nothing else to say about Mondays. They exist. And that's kinda unfortunate. I've got a two-fer today! Two nautical cards using some new goodies from Paper Smooches and Studio Calico. The first card was made for the Paper Smooches SPARKS Cool Shades challenge, The CAS-ual Fridays "Stamp on DP" challenge, and the Play Date Cafe #182 color story. You have until Tuesday 11:59pm EST to enter this color story!! 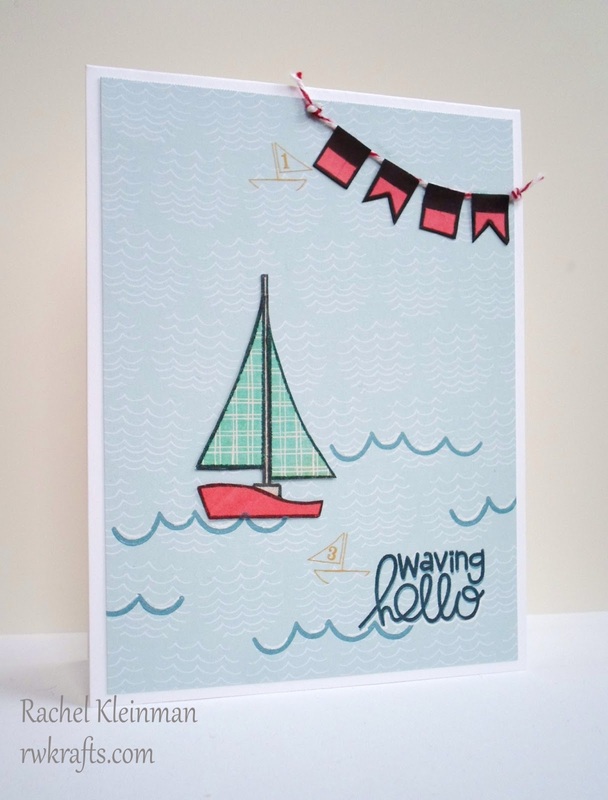 I used the new Paper Smooches stamp "Wicked Nautical" for this little sailboat card. 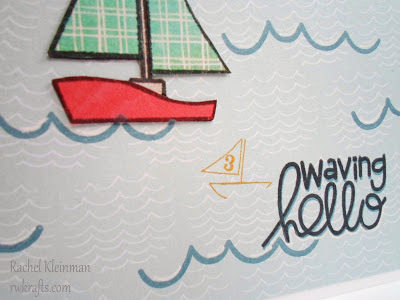 And the cool paper from Studio Calico "Atlantic" collection already had a pattern with little waves and sailboats on it. Per-fect. To brighten up the sentiment I double stamped it (first with chalk ink, then Memento ink) and then traced along the bottom of the letters with a white gel pen. I also traced pieces of the stamped waves with white gel pen to give them some pop. 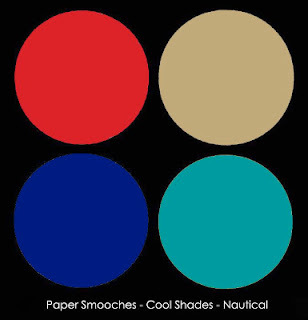 Sailboat card materials: Paper Smooches "Wicked Nautical", Neenah solar white cardstock, Studio Calico "Atlantic" paper pad, BasicGrey "Paper Cottage" paper pad, Memento "Tuxedo Black" ink, Versamagic chalk ink "Aegean Blue", red twine, white gel pen. 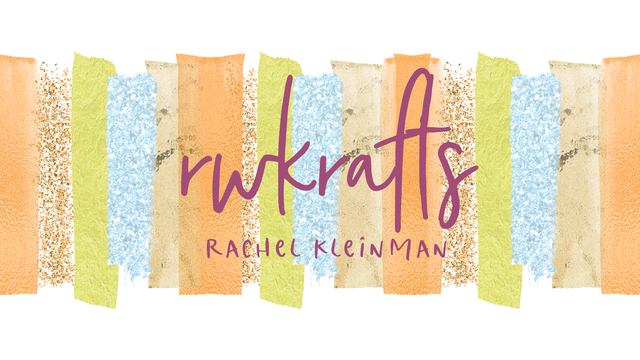 I am entering this second card only into the CAS-ual Fridays challenge to stamp on pattern paper. 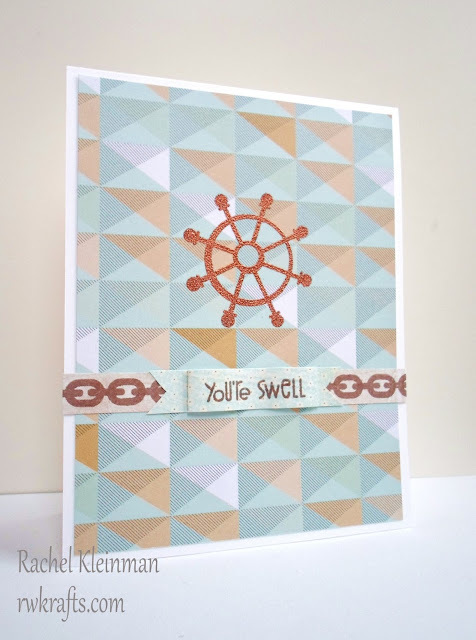 This card also uses Paper Smooches "Wicked Nautical" stamps and Studio Calico "Atlantic" paper pack. The helm is simply heat embossed with this metallic bronze powder to make it stand out from the paper. 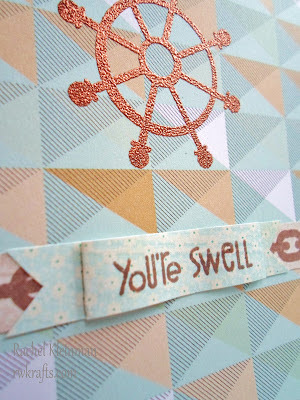 Materials: Paper Smooches "Wicked Nautical" and "Surf and Turf", Studio Calico "Atlantic" paper pad, Memento Ink "Rich Cocoa", VersaMark watermark ink, Recollections bronze emboss powder, Neenah Solar White cardstock. PS: Pumkin's looking really adorable and cute! Aw, Pumpkin's such a cutie and so are your cards! I love how you use the pattern paper!! Both cards are awesome!! I am really loving what you made lately! 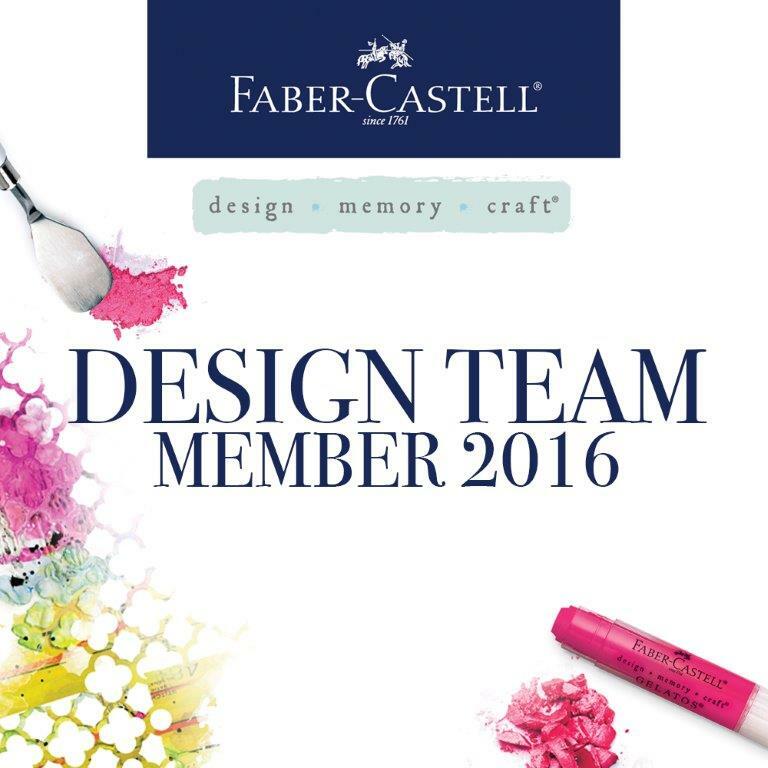 You have churned out some amazing designs...just saying :) Your pumpkin makes me smile! What a cutie! awwww, V! you always make me blush! :) Thank you! awww... pumpkin is so adorable! =) your cards are so cute, too! great use of colors and design! 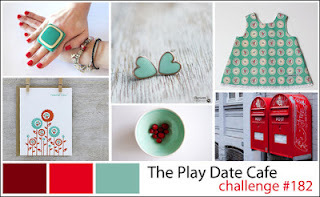 thanks so much for joining us this week at CAS-ual Fridays Challenge! awesome cards. 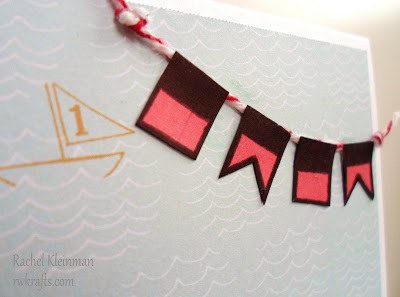 love the stamping and embossing on patterned paper. Very SUPER!!! Love Studio Calico, you used them superbly! Gorgeous cards! 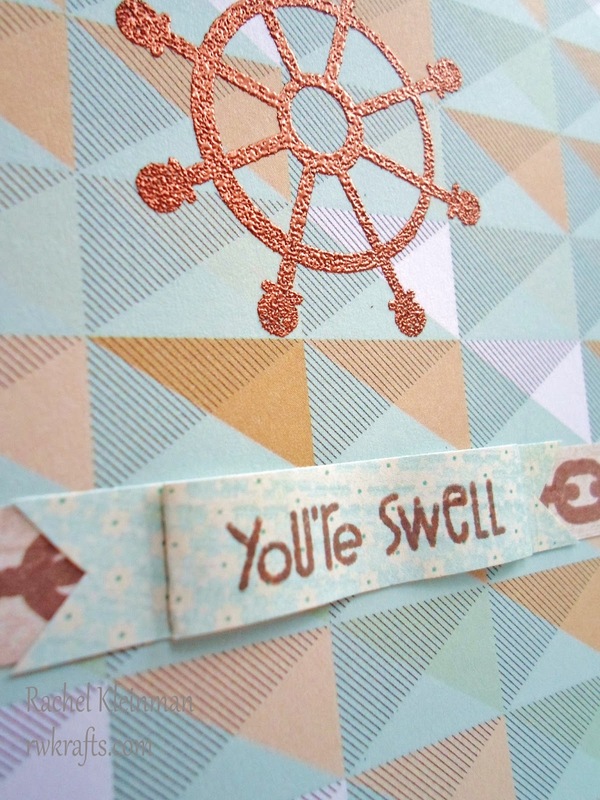 I love the 'you're swell' card's colors and layout. The first one is genius...way to let the DP work for you! I love both cards! 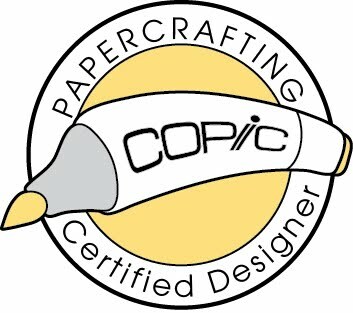 And how perfect is that patterned paper! Thanks for joining us at CAS-ual Fridays Challenge! so nice of you, Pamela! it's good to play with CFC again! 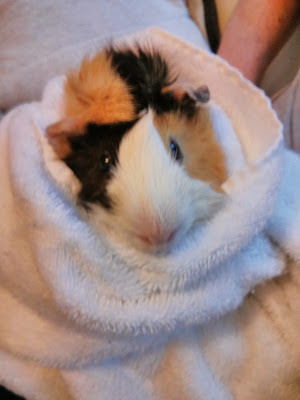 Pumpkin is so terribly cute! Eek (on both cards)! These are so cute. The details on the first card are amazing (like the double stamping--very impressive). I love the beautiful metallic embossing on the second card. Wow! Thanks for joining us at CAS-ual Fridays! pumpkin and I thank you for your sweet comment! and a huge congrats to you for the Sparks DT spot!!! enjoy your weekend as well! thanks, larissa!! Okay Pumpkin is DARLING! LOVE that sailing paper and your FAB boat! LOVE the embossing on the second one! Great job with both challenges! Loving the nautical card!